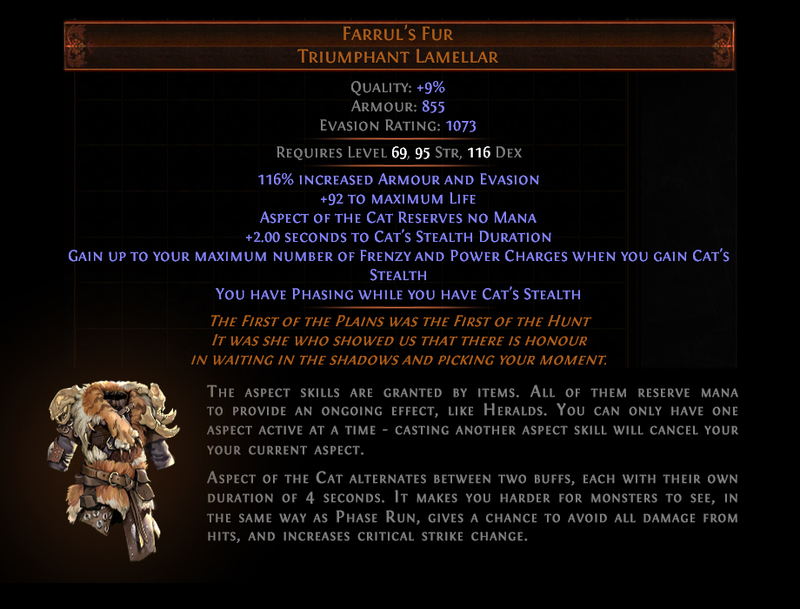 Bestiary Unique Items introduce Aspect Skills - Check out Farrul's Fur. I have ascended. This is the happiest day of my life! Seems like a really cool item! GGG is turning into EA - Metrics matter and "fun" is not a metric. PoE is now a ridiculously easy, lazy and shallow game, filled with more and more forced activities each league that exist just to waste your time, not provide a fun experience. Won't delete my builds but also won't update them. I will write something here when I can think of something clever and amusing. This is very confusing but looks very fun. So you gain max fcharge and pcharge once every 4 seconds just by using the cat's aura? Looks like every ten seconds with the +2 to cat's stealth. Will cat's aura makes us cough up fur balls? Can we get a youtube video in which you mouse over the item and the skill to show off their stats?